Today's recipe is the perfect recipe for a hot and busy week like ours. Catching up on work after my vacation has been taking longer than expected and since I am also doing a lot of behind-the-scenes stuff for the relaunch of my website, I haven't really cooked in DAYS. Shame on me. Most of the days I go to the farmer's market and buy peaches, salad and veggies and that is all I eat, plus I drink as much coffee as possible. I'm off sugar again entirely, after I decided that restricting my food intake in terms of sugary treats wasn't going to happen in New York (donuts!! ), I allowed myself to eat whatever I wanted on my vacation, and it's been a lot harder this time around to get rid of the sudden "chocolate! chocolate!" chants of my subconscious. I can do it! Peaches help, though! Anyway, this Italian summer salad has got it all - the tangy arugula, the sweet balsamic vinegar, the fruity tomatoes and a substantial handful of orecchiette. I also threw in a leftover piece of a yellow baby zucchini. So colorful! 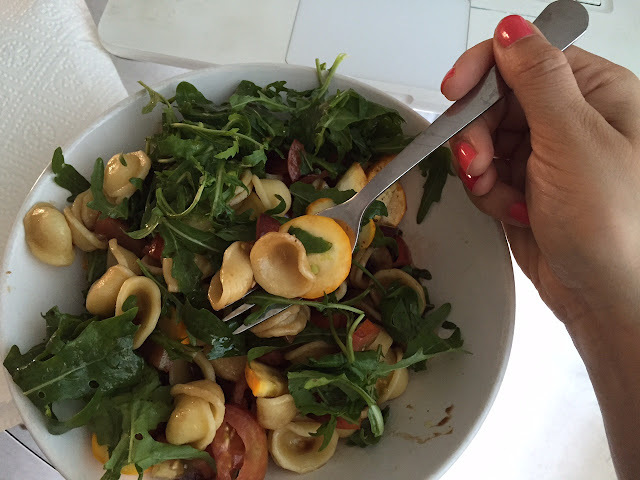 I cooked the orecchiette, set them aside to cool and cut tomatoes and zucchini in small cubes and slices. I drizzled some olive oil and balsamic vinegar over the veggies and added salt and pepper. When the orecchiette were cool, I mixed them with the veggies and dressing and added the washed rucola, shredding it into smaller pieces. And that is all! Simple, inexpensive, fresh, healthy. Also, vegan. I would have added a table spoon of freshly grated parmigiano but forgot the cheese at home (it was a lunch at work). Mozzarella would also work, even feta or, mmmhh, pecorino! Next time. What are your favorite dishes to prepare in the heat of Summer?